According to the Centre of Disease Control and Prevention (CDC), Nipah virus infection is an emerging disease that was first identified in 1999 during an outbreak among pig farmers in Malaysia and Singapore. As per the reports, at least three people in India have died from a rare virus known as Nipah virus. Recently, the state Health Department has confirmed Nipah virus (NiV) infection for the first time in Kerala. 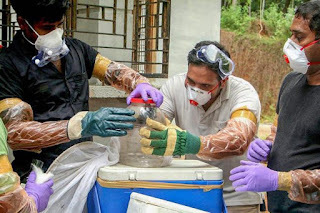 The blood and body fluid samples of two persons who died of viral fever indicated the presence of the Nipah virus. The Union health minister JP Nadda has directed to constitute a high-level team of doctors. This team would visit the district and initiate required steps as warranted by the protocol for the disease in consultation with state government. Nipah virus can cause an inflammation of the brain known as encephalitis. Symptoms can include fever and headache, followed by drowsiness, disorientation and confusion. People who are infected with the virus may fall into a coma within 48 hours of showing symptoms. According to the World Health Organization, it naturally infects the fruit bats but can also infect pigs and other domesticated animals, as well as humans. The virus can be highly lethal, with an average fatality rate of around 75 percent. As of now, there is no drug to treat the illness and no vaccine to prevent it.